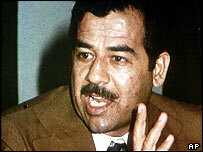 British diplomats secretly floated the idea that Iraqi dictator Saddam Hussein could be brought to the UK for a back operation, official papers show. He was seen as a figure to be courted when discussions took place in 1975. A senior UK official found Saddam's need for an operation "most encouraging" for the UK, files released by the National Archives at Kew show. The UK's Baghdad ambassador was informed, but the files do not indicate whether further action was taken. In early 1975, the attention of the Foreign Office had been caught by comments made by the Finnish ambassador in Baghdad, that there was a 90% chance that the operation he needed would leave him lame for life. Officials asked the government's own medical advisers whether the treatment could be carried out successfully in Britain. The outcome was reported to Britain's ambassador John Graham by Terry Clark, a senior official in the Middle East department in a letter. "I am advised that, if Saddam is suffering from a broken disc pinching the sciatic nerve, there is an operation, by name a laminectomy, regularly and successfully undertaken in various hospitals in the UK, by which there is a very good chance of total recovery," Clark wrote. "If the operation fails doctors usually advise a further operation, a spinal fusion. If the latter fails too, it usually means that there has been an erroneous diagnosis in the first place. "This is all most encouraging and, while I am by no means suggesting that we offer Saddam advice on the availability of such treatment in the UK, you may find the information useful should you ever receive and approach from the Iraqis."